1.1 What is Radar Online? 1.2 How Do I Contact Radar Online’s Staff? 1.3 How Can I Find Radar Online’s Social Media Channels? 1.4 What is the Address For Radar Online’s Headquarters? 1.5 Where Can I Download Radar Online’s App? How do I contact Radar Online? What is Radar Online’s Headquarters address? Where can I download the RadarOnline App? 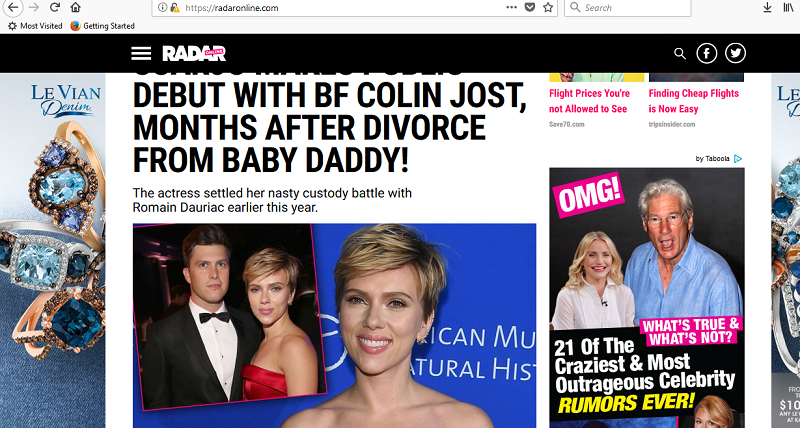 Everything you need to know about RadarOnline.com, the leading celebrity news portal. Radar Online is an entertainment news and celebrity gossip website, which is based in the United States and owned by the publishing company American Media. Initially, Radar was a print and online publication, which focused on a number of topics, including entertainment, news, politics and general interest stories. The magazine was launched in 2003 by its founder and editor, Maer Roshan. However, it consistently underperformed in terms of sales and struggled to compete with established rival publications. As a consequence, it was subsequently relaunched multiple times. Production of print issues ceased for the final time in 2008. In 2009, Radar was relaunched again as the online only platform RadarOnline.com, with a renewed emphasis on celebrity gossip, scandals, rumours, reality television and pop culture. The re-branding of Radar meant that all previous articles written for the website were removed, in order to align all online content to its new vision. At present, the website attracts more than nine million unique visitors each month, and generates more than 50 million total web page views. Each day, the website also posts more than 50 new pieces of content. Radar Online’s parent company owns various other publications, including National Enquirer, Us Weekly, Men’s Fitnesss and OK! Radar Online is a popular source for celebrity gossip, but the website also often adds breaking political news. The homepage is located at: https://www.radaronline.com. How Do I Contact Radar Online’s Staff? This email address is primarily designed to be used if you have news or tips for the Radar team. Alternatively, you can call the Radar news hotline on: 800-344-9598. This phone number is available 24-hours a day, seven days a week, and is again intended to make it easy for site users to send news or tips to the Radar team. A separate, more general phone number can also be used and the number to dial for that is: 818-789-3644. Should the reason for getting in touch be more professional in nature, you may instead wish to contact Radar Online’s parent company, American Media, Inc and the phone number for this is: 212-545-4800. Finally, the phone number to call if you would like advertising information is: 323-658-2019. How Can I Find Radar Online’s Social Media Channels? If you would like to get in touch more generally, or if you would like to provide feedback about the website, its content or a specific article, it is more advisable to use Radar Online’s various social media channels. These can also be used to access articles and keep up to date with the latest content published on the site. Depending on the social media site in question, you may need to have an existing account with the platform and be signed in on your web browser in order to gain full access to the content posted by the company. An account will definitely be required in order to leave comments or send messages. In total, Radar Online has more than 600,000 social media followers across the various channels. What is the Address For Radar Online’s Headquarters? 216 E 45th St, New York City, New York 10017, United States. American Media Inc, 4 New York Plaza, New York, NY 10004, United States. Where Can I Download Radar Online’s App? For those using mobile devices, it can be quicker, easier and more user-friendly to download Radar Online’s own dedicated mobile app, rather than browsing the main website in a mobile browser. The app allows users to do all of the things they would do on the main website, such as read articles, watch videos and listen to audio. In addition, the app allows for connectivity with social media platforms like Facebook and Twitter, making it easy to share articles and other content. The app is completely free and is available on all devices running either the Android or iOS operating systems. It can, therefore, be downloaded from the Google Play Store, the App Store or iTunes. A direct link for the Android app can be found here, while the iOS App can be found here. Please share your opinions, praise or complaints about Radar Online, in the comment section below. Thelma M Rehbein on Walmartone LoginHow do I find my weekly schedule? Kim k is a liar. She has fake brxxxxxx, multiple nose jobs. Augmentation and fillers on upper orbicularis oris muscle. Fat injections and fillers under the eyes. Look at her face in 2003. She has an upper thin lip and jutting out fat lower lip with under bite. She is very smart to make her face perfect. We resent that she says Kylie has insecurity about her thin lips. Kim, how about your upper lip augmentation and fillers . liar….. We love North West, a replica of kanye, but she is not the cuttest baby ever. Not better looking than prince George. How much Kim pays to hide her lies and plastic surgeries to E network…….